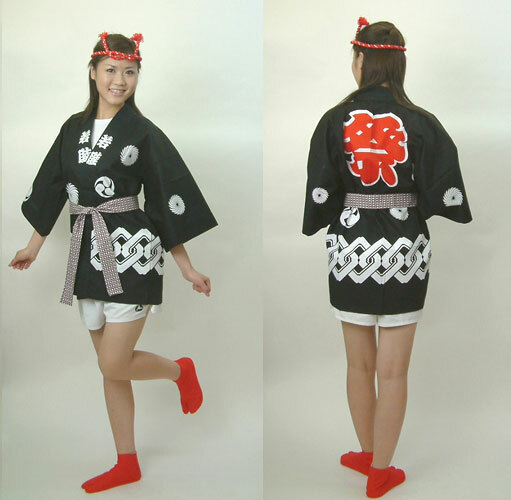 A happi is a baggy-sleeved short cotton jacket, tied with a sash around the waist, it is now worn mainly on festive occasions in Japan. This happi has the traditional Kuruwa pattern of entwined rings. A happi is a baggy-sleeved short cotton jacket, tied with a sash around the waist, it is now worn mainly on festive occasions in Japan. It is usually a plain color, typically blue, with a symbol printed on the lapels and on the back. 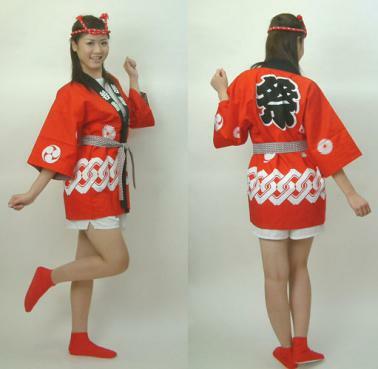 The happi coat is the traditional costume normally worn by Japanese today as much as, if not more than, the kimono. Available in various adult and child sizes in blue, red or black. The Junior size is equivalent to an Adult Small. Please note that the ages given below are only a rough indication and you should choose a size based on height.